Great for employees, this workplace abuse complaint letter cites a superior for verbal abuse and requests that HR address the problem. 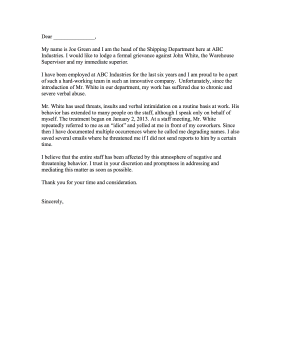 My name is Joe Green and I am the head of the Shipping Department here at ABC Industries. I would like to lodge a formal grievance against John White, the Warehouse Supervisor and my immediate superior. I have been employed at ABC Industries for the last six years and I am proud to be a part of such a hard-working team in such an innovative company. Unfortunately, since the introduction of Mr. White in our department, my work has suffered due to chronic and severe verbal abuse. Mr. White has used threats, insults and verbal intimidation on a routine basis at work. His behavior has extended to many people on the staff, although I speak only on behalf of myself. The treatment began on January 2, 2013. At a staff meeting, Mr. White repeatedly referred to me as an "idiot" and yelled at me in front of my coworkers. Since then I have documented multiple occurrences where he called me degrading names. I also saved several emails where he threatened me if I did not send reports to him by a certain time. I believe that the entire staff has been affected by this atmosphere of negative and threatening behavior. I trust in your discretion and promptness in addressing and mediating this matter as soon as possible.